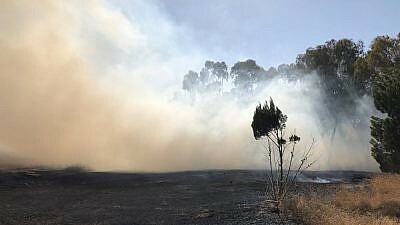 Scorched earth and trees, the result of fires in the Negev Desert in Israel due to arson terrorism from Palestinians in Gaza. July 2018. Photo by Tom Oren-Denenberg. Jewish National Fund (JNF-USA) is bringing Israelis to the United States to put their voices to the headlines and share their personal stories of living along the Gaza border, where hundreds of incendiary kites, balloons and rockets have steadily rained down on them for months, destroying thousands of acres of crops and forests, in addition to the ecosystems and wildlife they contain. Since March, rioters and terrorists from Gaza have traumatized the people living in neighboring communities along the Israel border, placing thousands of people’s lives in danger and causing many to seek safety in shelters. The fires and damage sustained have had a tremendous impact on the mental health and livelihood on those who call the region home. Thousands of acres of farmland have been scorched — decimating the region’s agricultural economy — and the number of individuals experiencing and being treated for Post-Traumatic Stress Disorder has seen an increase. JNF-USA has also launched an emergency campaign to advance relief efforts and support the communities affected by this terrorism.The speaking tour, titled the “Gaza Border Crisis: The Trauma, The Damage, The Needs,” kicks off in Los Angeles on Aug. 19 and will include stops in Phoenix (Aug. 20); Las Vegas (Aug. 21); Denver (Aug. 22); Chicago (Aug. 23); South Florida (Aug. 24-Aug. 26); Washington, D.C. (Aug. 27); Boston (Aug. 28); Southern New Jersey (Aug. 29); Philadelphia (Aug. 29); and New York (Aug. 30). An updated schedule with additional information is available at: www.jnf.org/gazatownhall. In addition to funding trauma resilience centers, the Sderot Indoor Recreation Center and animal-assisted therapy in the region, the organization is planning to add new bomb shelters that can house 100 people each, paint bomb shelters already in place to make them more child-friendly, provide new firetrucks and firefighting wagons, purchase life-saving equipment and fund activities for children of the region.